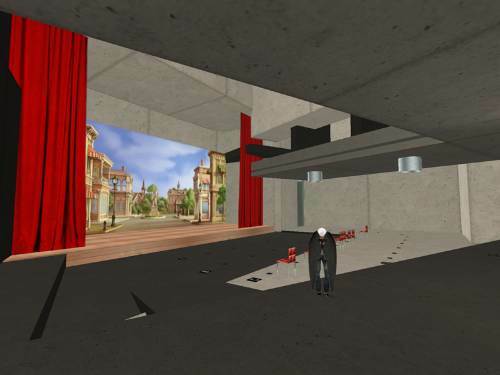 This theatre was contracted by Languagelab.com to be installed in their sim Arts. Another building with same function already existed in this space, and was replaced by this one. 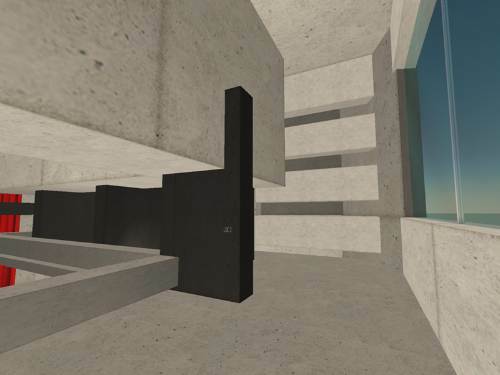 Major requirement was that the building created would not be lag-heavy, either in terms of polygon or texture rendering. 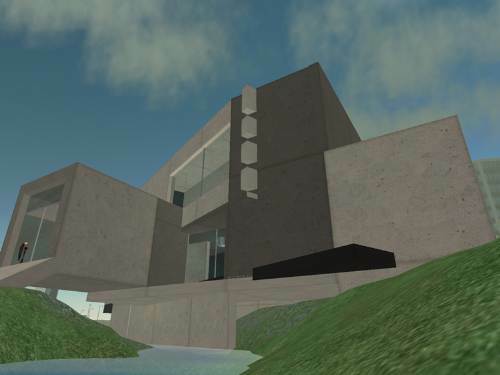 Languagelab.com also wanted a more modern look than of the previous building. 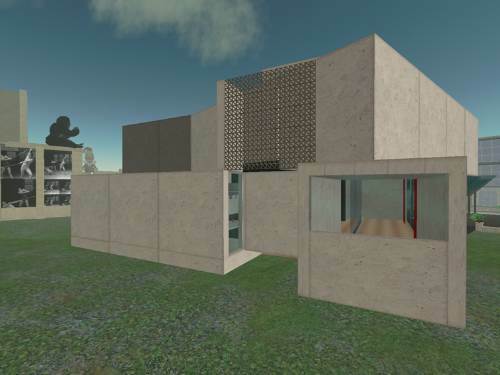 We decided then to create a building with a very raw texture scheme in concrete, metal and glass. The number of different textures applied is minimal, and we relied on colour variation to enhance mass contrast in several areas. About the space itself, it is composed by two rectilinear structures that are rotated over one another. This gives a very defined torsion to the space, creating a very dynamic feel to the building. 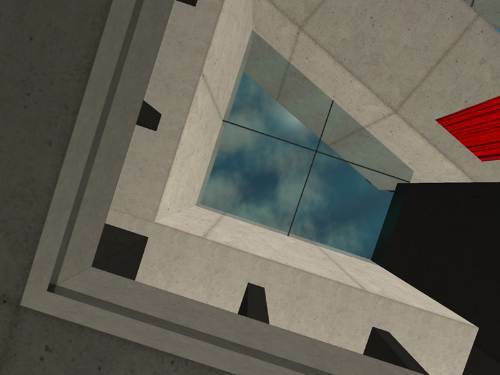 The use of these two rotated spaces also allowed to create two different references, or directions, to space, which were then used to sculpt the building. The building is also inserted in an urban space, which is currently being remodelled. 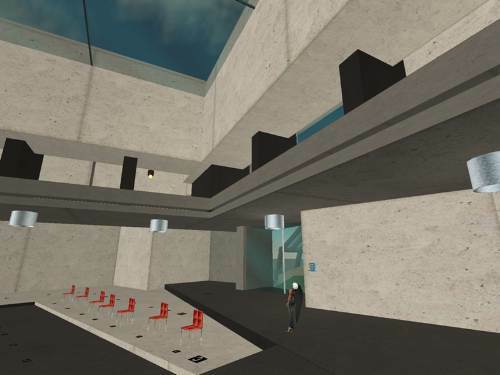 The space for this theatre is notably constrained on one of the sides by a large structure that is oriented ortogonally to sim (and world) space. The use of the torsioned space in the build allows it to “fight” this large mass, by defining its own “breathing” space. In the theatre grounds, there is a small stream. What initially was something that even constrained more the space, became very useful in terms of concept. A passageway was created over this stream, and the building was anchored to the ground here, taking advantage of the level difference between water and ground. 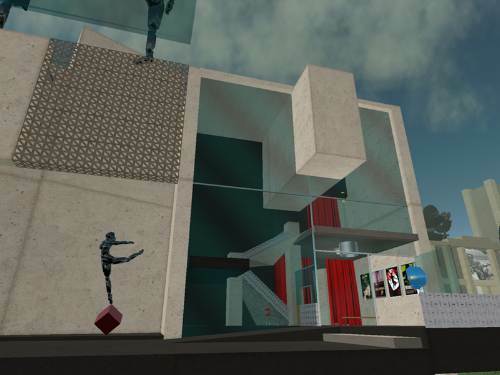 At the main facade, the building is connected to the urban tissue by a plaza, which already existed in the other building set. It was somewhat undeveloped as a space, and by the time the theatre was half done, it was definetely out of pace with the new language used. 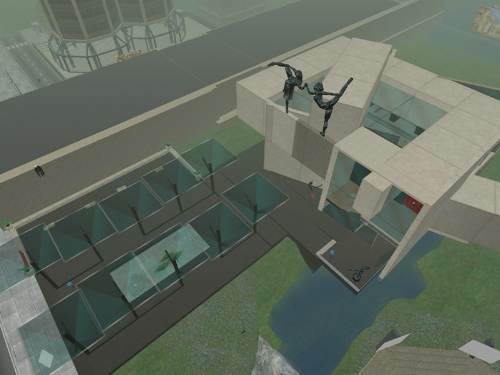 it was decided then to build a new plaza. We maintained the plaza implantation, which is off-centre to the build, choosing to have it balancing out the building’s mass. We created a shallow pond in the centre of the plaza, a very simple sheet of water, surrounded by concept trees. 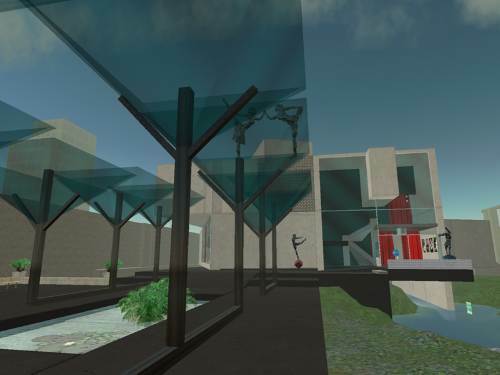 These trees, in glass and metal, are subtly asymmetric, and they define the walking space in the plaza. They also allowed us to leave free the slope to the river, and thus making the visual connection to the rest of the Arts complex on the other shore. As for the organization of the interior space, the torsion of the space allowed us to create a level for boxes, which is rotated inside the theatre space, providing max visibility. At the ground level, the same use of the two reference frames allowed us to create the seat steps in a non-rigid distribution, which adds interest to the space. The whole inner space rotates thus towards the stage, making it the main attention point. Languagelab.com also wanted the inner space to be “definetely a theatre”. We used details in red velvet such as curtains and camera-adjuting scripted chairs to set off the relative somberness and simplicity of the inner textures, with great effect. We used extensively very light-feeling, detached pieces of concrete as rails, creating a very interesting contrast with the more massive elements. We also created several light intakes to the space, namely at the backstage (the stage can be fully opened to provide the theatre with a “live” set) and also a very large skylight. At the end, we feel the build to be very successful. It meets the client’s expectations, point by point. It fulfills the function, and fulfills it in its own distinct manner. It has a very unique, self-consistent form, that arises from that function. And this makes it successful as far as an object that is born from a design conceptual process. Yet, to be an architectural object, it also needs to create its own space. And it also successfully does that, both as in terms of relation to surroundings, as in terms of the creation of a self-referenced space.